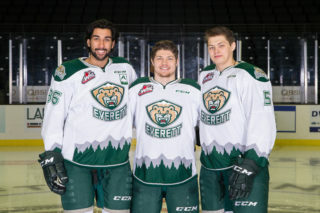 PORTLAND – Martin Fasko-Rudas scored twice in the opening period and added an assist, while the Everett Silvertips never trailed to defeat the Portland Winterhawks, 5-3 for their fourth win in five games before a crowd of 2,408 at Veterans Memorial Coliseum in WHL action on Sunday. 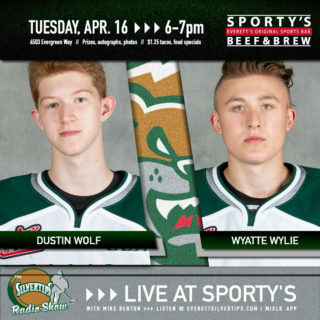 UP NEXT: The Silvertips open a four-game homestand and complete the “home-and-home” series with the Winterhawks on Wednesday, 7:05pm (1380 AM / 95.3 FM / Tips App / WHL Live) in downtown Everett. 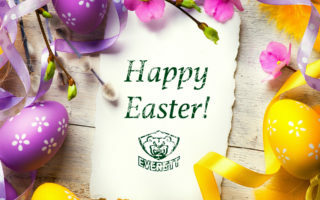 Tickets are on sale at www.everettsilvertips.com/tickets. Fasko-Rudas got the Tips on the board, 1:53 into the game when he deked Shane Farkas to the blocker side. Jared Freadrich tied the game at 5:05 on Mason Mannek’s cross-ice heave to the right circle, but Fasko-Rudas restored the Tips lead at 2-1 when he stripped Farkas in the trapezoid and stashed a backhander on a wrap-around attempt. 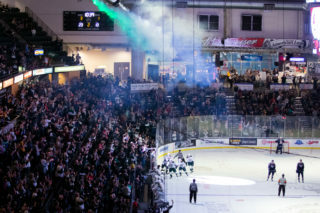 Wolf preserved the Silvertips lead on a highlight-reel, diving stick side save on Joachim Blichfeld’s open net attempt from the left circle, halfway through the opening period. Reece Vitelli then took a relay at center, originally set up by Wolf’s clearing attempt, and streaked to the net from the left wing to bury his second goal of the season with 3:49 left in the first for a 3-1 lead. Wolf then turned away Ryan Hughes on a shorthanded breakaway in the second period and the Tips capitalized on a late period penalty kill to extend the lead. Fasko-Rudas set up Luke Ormsby between the circles, who stashed his second goal of the season with 2:26 left in the period for a 4-1 advantage. Just 27 seconds later, Michal Kvasnica finished his second goal of the season in front of a screen to get the Winterhawks back to within two goals, and then Joachim Blichfeld finished a five-on-three goal with a one-timer at the right circle, 9:27 into the third period to get Portland within 4-3. But the Tips, undeterred, sealed the game on Connor Dewar’s empty netter with 29.2 seconds left, after he produced a turnover on Brendan De Jong at center ice. Farkas made 27 saves to take the loss. 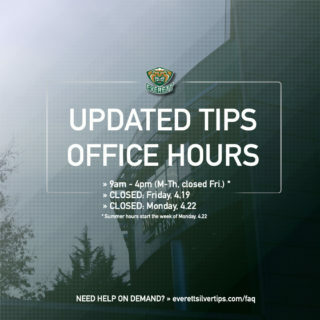 NOTES: Silvertips scratches include Gianni Fairbrother, Conrad Mitchell, and Bronson Sharp … the Tips improved to 4-0-1 in the last five games … their head-to-head record against Portland improved to 4-2-0-0 this season, and the Tips have won two of three meetings in Portland … Dewar’s 21st goal was his third in two games … Fasko-Rudas earned the first multi goal game of his career.